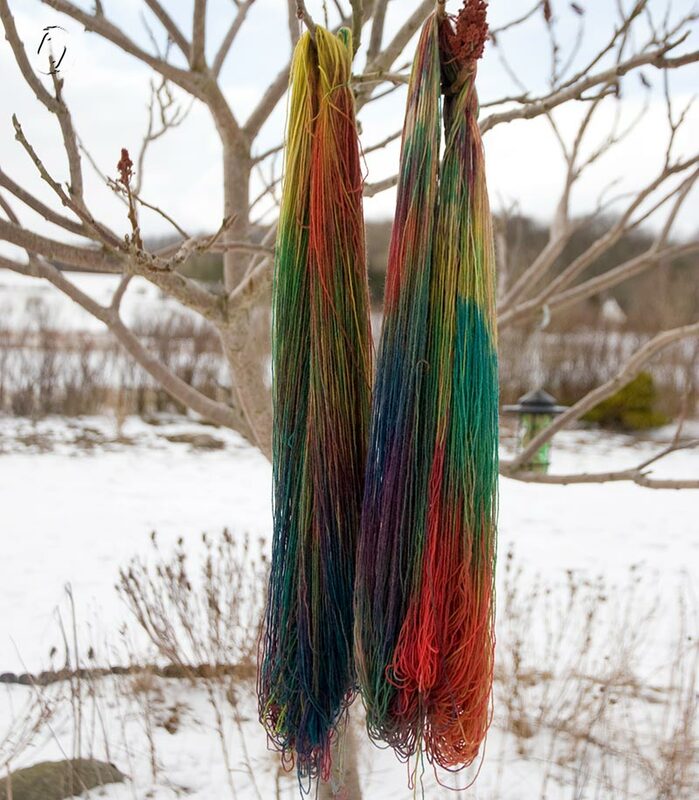 Snow dyeing is a bit like tie-dyeing, only more unpredictable. But groovy. And in this case, very loud. At least to begin with! I hadn’t planned the colours before I got started, which tends to result in too many of them. I thought I’d used very little powder, being careful to keep the areas separate, but as you can see throughout the process, it was more than ample. 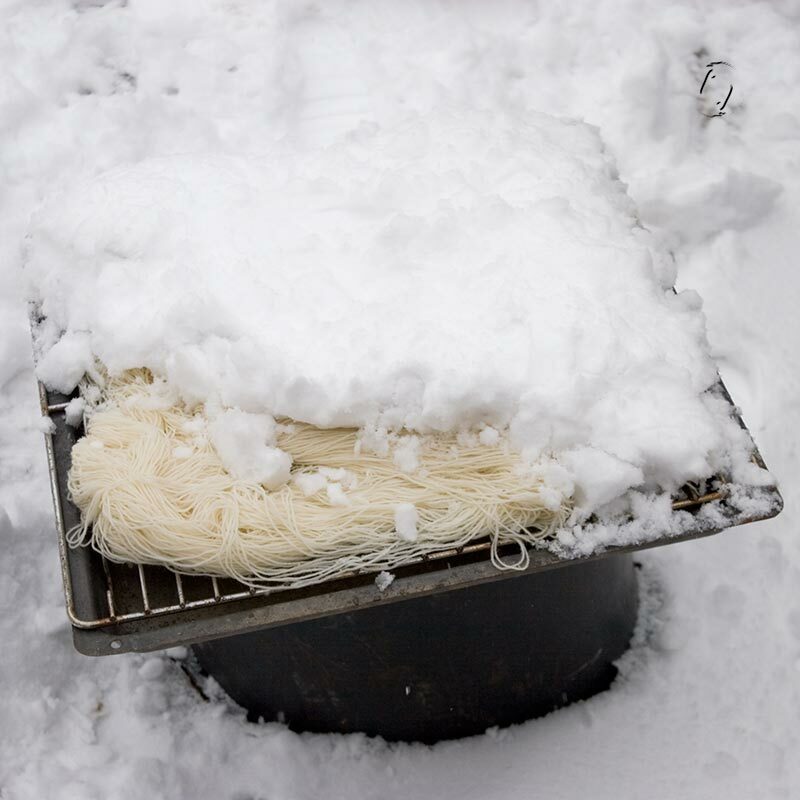 I’d love to try to mix the powders beforehand (for special colours) and apply them to the snow with a small sieve, just a light sprinkle to get spotted yarn. I haven’t got one however. I may try – something. Just one more skein, since the white fluff isn’t going to evaporate this month apparently. 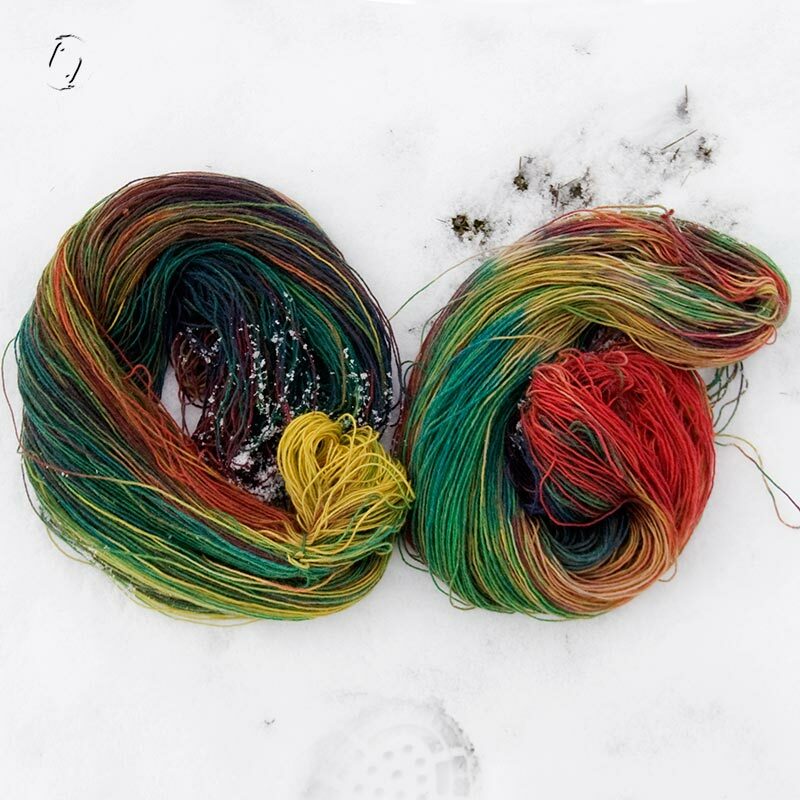 1 – I know this yarn needs to be tied, and Every. Single. Time I think – “nah, it’ll be ok.” I must love detangling. I do know why I don’t tie it – it’s because I hate it when my figure-8s are too tight, leaving little white bands on the yarn. But, really – learn to do your ties properly. 2 – So I also do know my colour wheel and which colours = mud. As long as you keep them separate, fine, and a teeny bit of blending just mutes them, also fine. 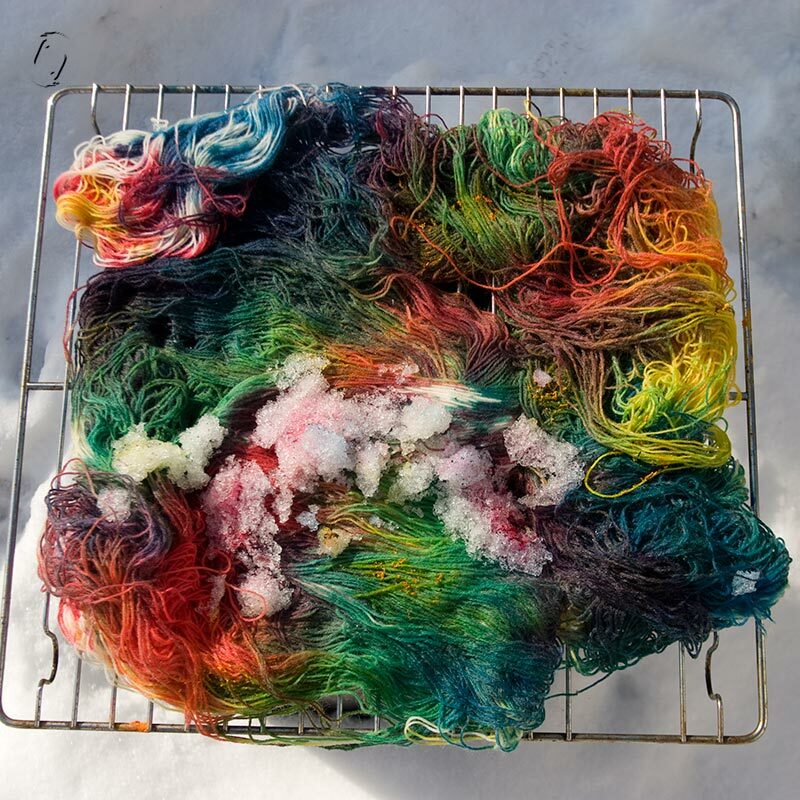 What I did think but did not listen to, is “let the yarn drip dry before you attempt to set the dye“. It’s been soaked with melted snow, it’s overflowing. A bit of a squeeze isn’t enough. What happens when you lie it inna heap in the sink? The overflow blends. Guess then what. And yes, I do have a strainer. In fact I have 3. This also goes if you want to wrap your yarn in plastic and steam it. Let it drip dry first. OK? Preferably stretched out horisontally, like, leave it on the rack for instance? 3 – Bubbles and steam does not mean your water is near boiling, in fact it’s only about 65 C. Not enough to shock set your dye. = Muddy water. Flush and repeat. Get your bleedin’ thermometer out. 4 – Do this part of the process when you’re NOT supposed to be doing something else and so feeling guilty and in a bit of a hurry. Resist instant gratification. Surely it can’t be that hard. I suggest you read some tutorials if you haven’t done this before. I never do until I’ve tried and screwed up at least once, usually twice or more. By which time I’ve usually got it figured out. I guess I have more fun that way, even though I get slightly odd results in the process. Jeg skulle liiiige prøve noget snefarvning nu vi fik et ekstra hvidt drys, og ja, det er sjovt fordi det er ret uforudsigeligt. Især når man kvajer sig undervejs. 😉 Jeg har en tendens til at først læse manualer og tutorials når jeg har forsøgt mig mindst én gang, gerne flere. Og så har jeg som regel hittet ud af det undervejs. Det er åbenbart sjovere end at få et perfekt resultat med det samme? 1. Brug meget mindre farvepulver end du tror du skal. 2. Lad garnet dryptørre grundigt inden du smider det i en gryde kogende vand eller plastwrap til dampning, der er RIGTIG meget overskudsvæske i fra sneen, og den blander sig til brun, hvis man bare lægger garnet i en bunke i håndvasken. OGSÅ selvom man trykker noget af vandet ud. 3. Mål vandets temperatur inden du putter garnet i, det er ikke ved at koge når der er damp og bobler, det er kun ca. 65 grader og det trækker endnu mere brunt ud af garnet. Tålmodighed er en dyd jeg ikke har så meget af…. Nu kan jeg så bruge x antal timer på at vikle skidtet ud! A good day to ply! we have a lot in common ;-). I love to experiment, much more fun that way.. Love your yarns/the results!! I see you don’t tie your yarns either (I’d already been by earlier, but they deserve another look). 😉 How do you manage to keep them tangle free? It doesn’t show much in my photos actually, but they need to be reskeined if I’m to ever use them. I LOVE it!!!! I am sooooooo going to do this. Dang – my snow is melting!! You may get me to pull out my mordant pot to get it started. LOVE, LOVE, LOVE it!! I thought I’d missed the opportunity as we had real thaw and everything seemed to be getting ready for spring. So when we ended up frostbitten again, I just had to give it a go. Can’t wait to see what you cook up! Heh, maybe it isn’t as muddy as all that, then? 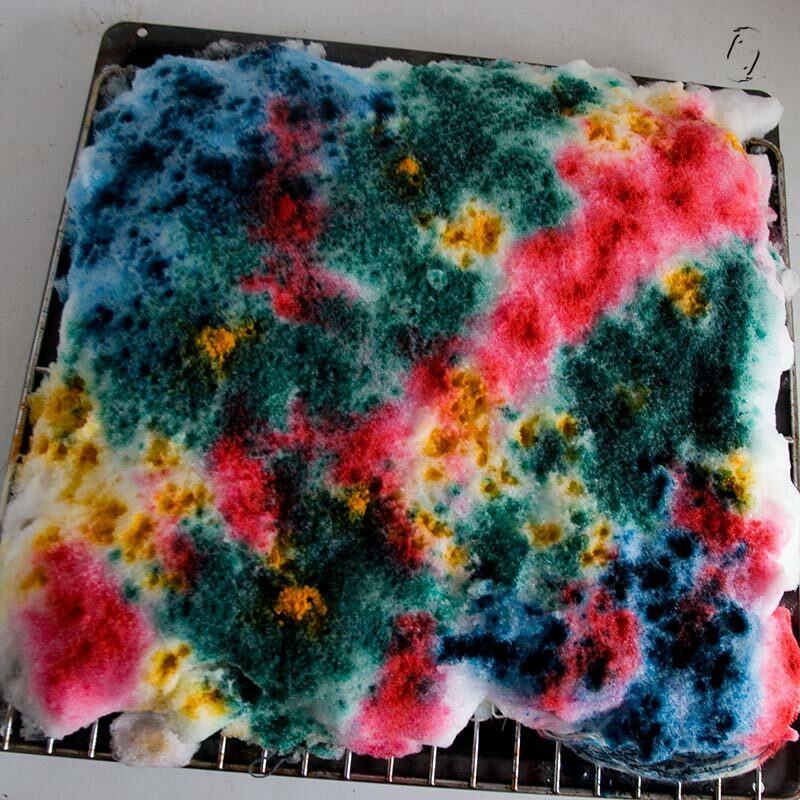 I’ve made a very puzzling observation: when I spin or dye I can play, have fun, relax, do random things and not care (too much) about the result. As opposed to painting and writing which apparently are so dead serious and frightening that I either fall asleep from exhaustion or have an anxiety attack to keep me away whenever I try to go there. I wonder what the difference is. Herlige farver, sjov metode. Hvad er det for nogle farver du bruger? De brune omrøder på garnet vil helt sikkert give en smuk kontrast, når du srtikker med garnet. Jeg bruger Ashford pulverfarver. Så bare give garnet et godt bad i eddikevand først (som fikserer farven), sne på, drysse farve, lade smelte langsomt et sted, i mit tilfælde bryggers med ca. 5 grader, lade det dryppe af, koge en gryde vand med mere eddike, slukke og så sænke garnet ned i, så sætter farven sig med det samme i stedet for at blive opløst og mudret. Hvis vandet bliver lidt for køligt (under 70-75 grader) af det kolde garn holder man lidt liv i blusset, ellers kan man bare slukke og lade gryden stå til det er koldt. Lol I relate to this so much. Sometimes I know what I’m doing will result in things going wrong, yet still I proceed… The yarn looks good to me though! I thought that was just me, I wonder what makes us behave like that. Haven’t a clue, its strange isn’t it? Maybe some sort of tendency to sabotage ourselves? Could be a self esteem thing, related to self hate? I’m just hazarding guesses really. Be interesting to know how many others do it. Or as Alexandra mentioned, a kind of laziness. A backwards way of getting that instant gratification; can I avoid a small bother now, even if it means I’m getting a bigger bother later? After all, later is later and doesn’t feel as real as now. Like many kids will choose one chocolate today instead of two tomorrow. But still, being aware of it one should be able to stop and be sensible. That sounds convincing to me! I have no idea, that is, could end up as the feathers on a shawl called dreambird. Can’t make a link as I’m on a tablet, slow going. My data disk on pc is on the blink and hopefully copying right now. Q – Beautiful! Now for the snow….. LOL! I’m in San Diego.